We offer aluminum fluoride that is widely used for various applications such as flux in welding, brazing, soldering gloss in glass, ceramics and enamels. SB Chemicals is one of the trusted Aluminum Fluoride Manufacturer and Supplier (AlF3) is also known as Aluminum Trifluoride and Trifluoroaluminate and is available in appearance of White Powder. ParametersGuaranteed - %Typical - %Purity as AlF390 Min.90 - 92Silica as SiO20.2 Max.0.05 - 0.10Phosphorus as P2O50.02 Max.0.008 - 0.015Iron as Fe2O30.05 Max.0.01 - 0.02Loss on ignition at 550 ºC for 30 Min.0.30 Max.0.4 - 0.7Sulphate as SO30.50 Max.0.2 - 0.35Sodium as Na2O0.50 Max.0.2 - 0.30Aluminum oxide as Al2O3By difference6.0 - 8.0Angle of repose35 Max.31 - 32Flowability60 sec. Max.51 - 54 Sec. Packaging Details: 25/50 Kg plastic woven bags with liner. Palletised to 1 MT on a wooden pallet. 1 MT Jumbo Bag. 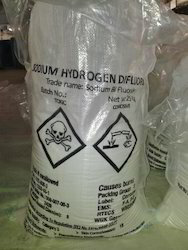 Sodium Hydrogen Difluoride offered is also known by the names of SODIUM BIFLUORIDE; SODIUM DIFLUORIDE; sodium acid fluride and others and comes with CBNumber of CB7670064 and molecular formula of F2HNa. Available in form of pellets as well as white free flowing powder, it is soluble in water and finds usage in preserving of anatomical and zoological specimens. Other than this, it is also used in areas of metal plating, as neutralizer in laundry rinsing operations, etching glass and other uses. It reacts with water liberating heat and forming corrosive solution. Looking for Aluminium Trifluoride ?